ISI is the sole representative of the full line of Cassani grinding and polishing equipment for tiles and concrete slabs in North America. Cassani has been in the floor polishing and grinding business since 1904. They are one of the industry’s leading providers of equipment in this space and put their emphasis on designing equipment of the highest quality. When pavers and blocks exit the production line they are nearly flawless. This finished product isn’t the ideal look for some projects which require matching blocks to current architecture or for homeowners who want a more aged looking paver. This is where surface treatment for concrete comes in through the usage of surface treatment machines. These machines “age” the blocks giving a more natural look where desired. 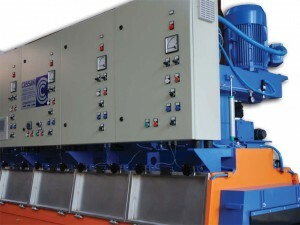 Cassani production lines and equipment can be customized according to your production needs. Whether you need a single operating station, or a 10-station production line, Cassani has the proper equipment to get the job done. Contact us to place an order or visit the Cassani website for more information.